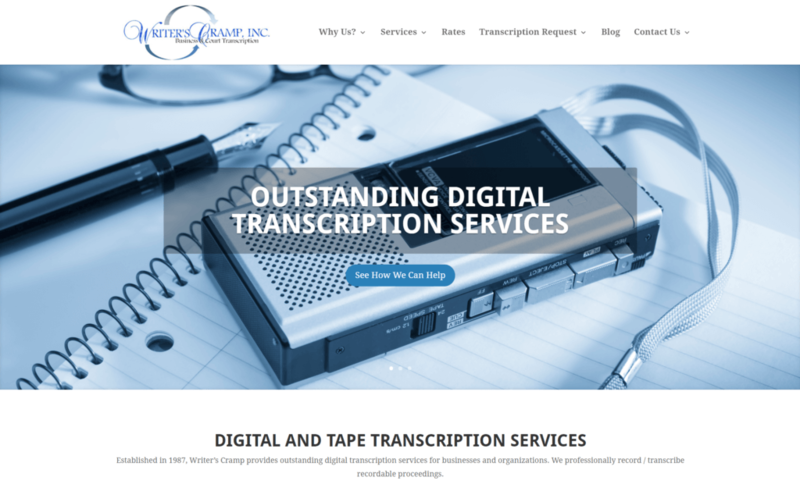 An outstanding digital transcript service like Writer’s Cramp, Inc needs an outstanding digital presence to match it. Market3 is excited to announce the launch of the new Writer’s Cramp WordPress website. Writer’s Cramp, Inc. has over 25 years of transcription industry experience. Their highly-educated professional staff specializes in offering premium audio and digital transcription services for a large variety of clients. Some of the services they offer include affordable tape and digital transcription, voice transcription, verbatim transcription, and edited transcription. One of the greatest website features for the transcription company is the extensive project estimator tool. The project estimator allows customers to select multiple project options, upload files, and pay for a new project “on the fly” making the whole process easy. Customers are also able to pay invoices online directly through the new website. platform has many benefits. Our New Jersey web design team custom-built Writer’s Cramp’s website to ensure it fit the client’s needs. One of WordPress’ features includes being responsive and mobile-friendly for all smartphones and tablets. The website also interacts with Writer’s Cramp’s social media presence allowing for visitors to easily navigate between the two. Writer’s Cramp’s website is built on CMS or content managed system. This gives the client the full capabilities to manage their own site, including updating content, videos, and photos. This ability gets rid of the need for risky proprietary software.